Jason’s career in the hospitality industry began in an Italian Trattoria in Westfield, New Jersey. What started as a curiosity quickly turned into a passion as he enrolled in the Scottsdale Culinary Institute in Arizona. Upon graduation he would venture further West and worked for notable Chef Thomas Keller at Bouchon in Yountville, CA serving as a member of the opening team. It was during this time that he received a crash course on hyper local cuisine and would become an advocate for small farms. Jason went on to work under Charlie Palmer at both the Dry Creek Kitchen in Healdsburg, CA and Charlie Palmer Steak at the Four Seasons Hotel Las Vegas gaining valuable experience with food and wine pairings. 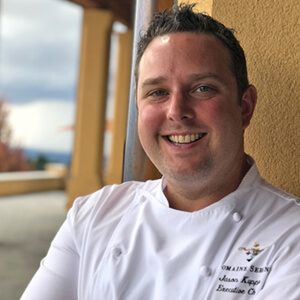 Prior to becoming Executive Chef of Domaine Serene, Jason returned to Napa Valley to serve as Chef de Cuisine of The Thomas, a Michelin recommended restaurant blending farm to table cooking with international flavors. Chef Kupper followed that up by opening his own venture, Heritage Eats, where he earned high praise by Food & Wine Magazine, Zagat, and Eater SF. His decision to move to Oregon was inspired by a trip over a decade ago where he first fell in love with the beauty of the Pacific Northwest and his desire to connect with its bounty of ingredients that are unique to the region.